Rising from the Coastal Plain: A Proper Mt. William & Mary! 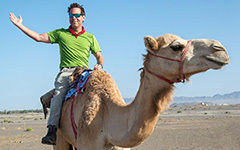 Over the years I’ve used this blog to report on geologic research in a format that’s intended to be both accessible and digestible by a wide audience. This post highlights an exciting new research finding, and explores the intriguing possibilities for William & Mary that could come from this ground-breaking discovery. 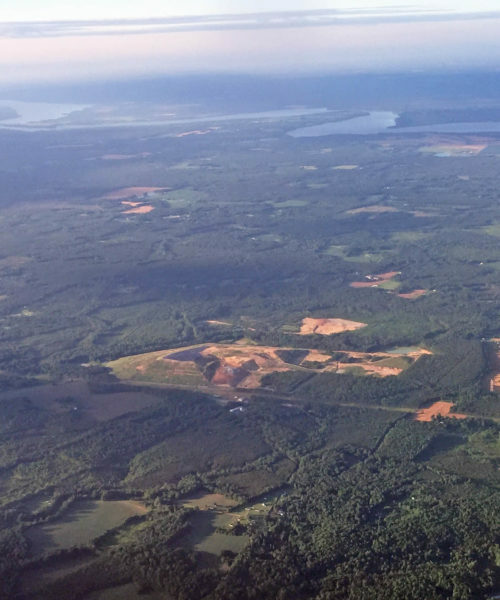 First, a little background: as you may know Virginia’s Tidewater region is quite flat. Williamsburg sits atop the Atlantic Coastal Plain. It’s a wedge of sediment that’s been deposited during the past 100 million years or so along the margin of the Atlantic Ocean. When sea-level stands high, the Atlantic floods the coastal plain across eastern Virginia. Yet, during low stands of sea-level, the Atlantic beaches may be 60 to 80 miles east (100 -130 km) of Virginia Beach and the Delmarva Peninsula. The Atlantic Coastal Plain is part of North America’s passive margin; at the trailing edge of the continent and it is not generally prone to much tectonic activity. Overall, the Atlantic Coastal Plain is subsiding in such a way that sea-level is rising across southeastern Virginia, and at many locations, it’s rising at an alarming rate. 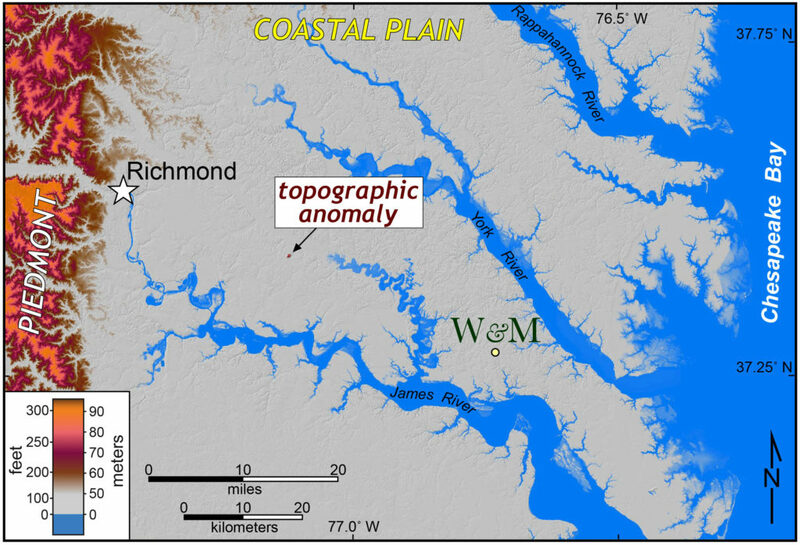 From a practical perspective, sea level rise means the region is sinking, but new research indicates that a topographic anomaly is growing in a rural patch of ground between Williamsburg and Richmond. The anomaly is located at 37.433° N and 77.122˚ W. See a detailed view. Shaded relief map of part of east-central Virginia illustrating topographic anomaly on the Coastal Plain. Oblique aerial view of the topographic anomaly in east-central Virginia. View is to the south and the James River is visible in the background. Since the 1980s a mountain has emerged from the sandy soil of the Coastal Plain. Today, its broad summit stands nearly 300’ (90 m) above sea level. Over the past four decades, it has risen at an average rate of more than 4 feet per year (1.3 m/ yr). The best rate that the mighty Himalayas have done during that same interval is ~1.2 inches (30 mm) of uplift per year. Clearly this peak is For the Bold! It’s the only mountain for many miles around. To reach a higher summit one must travel nearly 25 miles (40 km) west to the Piedmont or ~2,500 miles (4,000 km) east-northeast to the Azores in the North Atlantic Ocean. It’s got both topographic prominence and isolation – characteristics that make for a righteous mountain. A righteous and proper Mt. 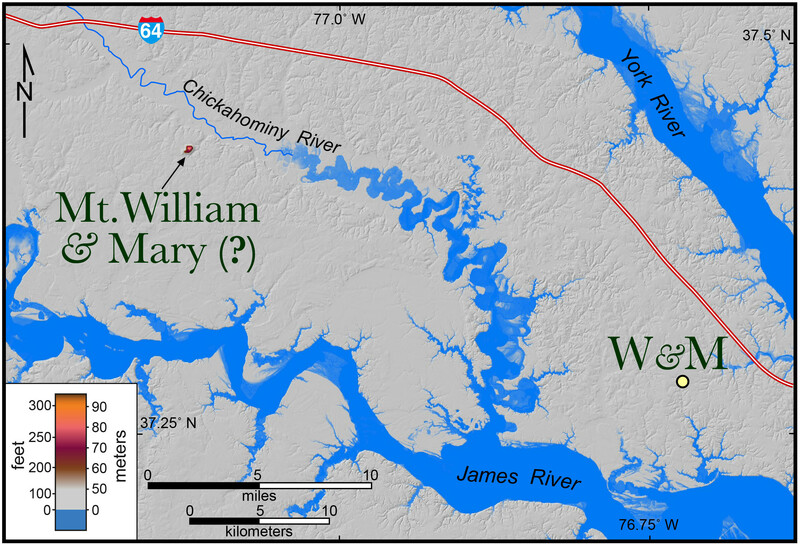 William & Mary located only ~20 miles from campus. I propose that we name this newly discovered edifice Mount William & Mary. It is a far better choice than the misguided and failed effort(s) by W&M to name a sub-peak in the Colorado Rockies. This homegrown alp is currently visible from office buildings in Richmond, and if the mountain continues to rise skyward it should soon be visible from Williamsburg. Our research indicates that there’s a connection between human activity and the mountain’s growth. A curious anthropogenic forcing is at work. A north-south topographic profile over the proposed Mount William & Mary. In the not so distant future, I can imagine a day when members of the Tribe will converge upon this mountain, climb to its broad summit, and take in unfettered views of eastern Virginia all while singing “William & Mary loved of old. Hark upon the gale, Hear the thunder of our chorus”. I urge you to get behind an effort to name a righteous and proper Mount William & Mary right here in our backyard! Excellent news! Who wants to travel to Colorado or the Azores when we can stay so close to home?! This is not of a similar provenance as Mt Trashmore, is it? I want a follow up! Sounds like field trip time!